In the documentary "Dawson City: Frozen Time," a treasure of decades-old silent films, buried in the frozen earth of the Yukon for several decades, is uncovered and restored, telling the story not only of early cinema but also of the shifting fortunes of the gold prospecting town whose birth coincided with the birth of movies. In that far-off city, whose population rose to 40,000 at the height of gold fever, movie theaters were a popular way to squeeze money from miners (as were gambling and prostitution). However, cans of nitrate film were too expensive to ship back, and too combustible to leave lying around, and so they were dumped in the river or buried. Hundreds of film cans went undetected until 1978, when a construction crew unearthed more than 500 reels. 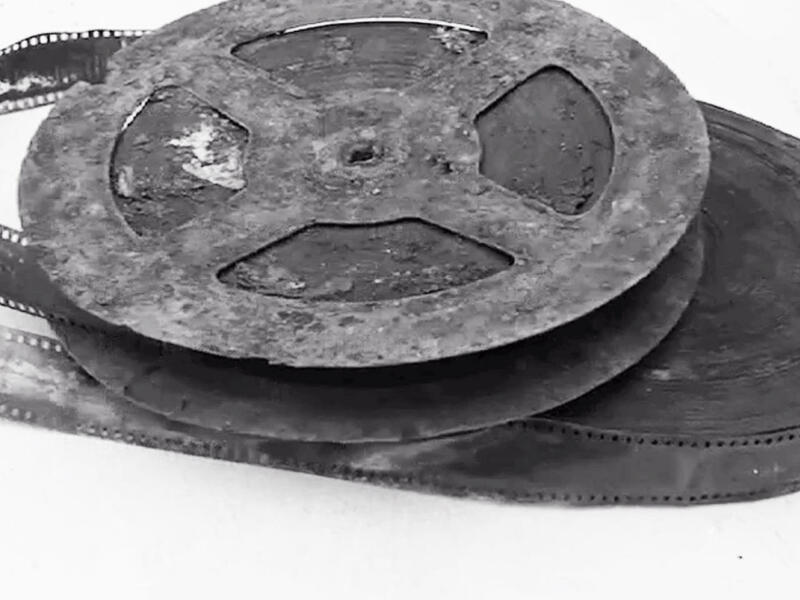 Filmmaker Bill Morrison ("Decasia") uses clips from the found footage and old stills to tell the story of the Dawson City Film Find, and of the town itself -- the tragedies involving its original inhabitants, the fortune-seeking prospectors, and the hordes of merchants and entrepreneurs who exemplified its energy, resourcefulness and despair. One of the most striking elements of the film is the music score -- an ethereal, haunting soundscape of processed acoustic instruments. As with the best film music, which is used to dig deeply into the psyches of characters to reveal an emotional connection for the audience, "Dawson City: Frozen Time" uses its score to conjure a time and place long lost, and a population whose ambitions, struggles and failures are all too familiar to us, a hundred years later. "This project was extremely different than any other scoring project I've done," composer Alex Somers told CBS News. "I needed to live with the idea of the Film Find and try to embody that into the music, and into the sound of the music. The sound component was equally as important as the composition and the melodic choices." Somers, a Baltimore native, is an artist, musician and engineer who is half of the duo Jónsi and Alex (with Icelandic musician Jón Þór Birgisson, whom he met at Berklee School of Music in Boston). He has written the scores for the TV miniseries "Manhattan" and the films "Aloha" and "Captain Fantastic." For "Dawson City: Frozen Time," Somers said he wanted the music to sound like it was coming apart at the seams and decaying -- reflecting the fragile images flickering on screen. "I think that was the main thread running through the whole thing -- the idea of something being worn out and beaten up and forgotten," he said. Somers did not look to period music or folk songs to recreate life in the Klondike from the 1890s, but used the environment and the fragility of the found footage to color the sound component of his score. "I don't really work in a literal sense, like read a book or think about those people and then try to write something that embodies that. I'm just trying to get a spark between whatever I'm writing and what's happening in the picture -- that's always the best feeling when you can find that -- and leave room for accidents and chance." In addition to writing music, Somers also engineers recordings for other artists. "I love sounds; I'm a sound freak," he said. "So I'm just obsessed with sound and layering sounds and creating sounds. My palette tends to be with acoustic instruments. I tend to use samplers a lot, with acoustic sounds over the top, more than synthesizers." While he employs computers, and Varispeed (a program to speed up or slow down audio and alter pitch), he also uses more quaint technology, like microcassettes. The soundscapes certainly bring to mind the beautiful Arctic landscapes of Iceland, from where many of Somers' musicians hail. But it also reinforces a timelessness to the score -- keyed not to specific events or personalities (as is usual in a fiction film) but to a mindset: a quest for fortune mined from the Earth, striving for hope in an unforgiving environment, despondency and ruin when a frontier town is on the decline. The film's Main Title features a deep, physically-imposing bass line -- wheezing and guttural, as if the dying breaths of a large animal -- mirrored by an airy, plaintive string line. "I recorded the double bass and then I slowed down the double bass and had the orchestra play to that, so the orchestra sounds live but the double bass had been slowed down like four semi-tones," said Somers. "[The double bass] has more breath, more texture. It's more exaggerated and deeper." Hear an excerpt from the Main Title of "Dawson City: Frozen Time"
"I try to always do stuff like that -- slow down the string section, slow down or speed up voices for choir. When I record the piano I'm often playing it too fast and then slowing it down, so it has this kind of lethargic tone to it. "For example, when I record piano, I usually have all the pedals down all the way," Somers said. "You get a lot of finger noise and lot of the damper sound. The sound is so physical and has so much imperfection, and then you hear fingers touching the keys -- like the physical sound of the piano as much as the tonal sound. And then when you watch it to picture, it's beautiful, it's rattling and haunting and eerie." Hear an excerpt from "Dawson City: Frozen Time"
Hear an excerpt from the End Title of "Dawson City: Frozen Time"
All the musicians are friends of Somers, from Iceland and Finland, with whom he's worked for the past decade. The players each laid down their tracks separately. "I would spend a few days with my friend Ólafur Björn Ólafsson (playing piano and vibraphone)," Somers said. "Then I spent a week with my friend Samuli Kosminen (who did percussion and a lot of the weird sound treatments). Then I spent two days with the string quartet (María Huld Markan Sigfúsdóttir, Hildur Ársælsdóttir, Edda Rún Ólafsdóttir and Sólrún Sumarliðadóttir). And then I spent one day with the double bass player, Borgar Magnason -- just me recording them on existing music that I've already written so they have a framework to play on top of." Because Somers did not score to picture -- tying the music beat-by-beat to action on the screen -- the composition and playing was loose, and not specifically tied to individual parts of the film's narrative. This also allowed for improvisation on the part of the musicians. Somers then spotted the film with the director to find the best moments to use each cue. This resulted in different versions of the score, owing to the director's view of the movie as more of a tragedy. "There's a lot of tragedy that happens in Dawson City, so he felt the original version of the score I did was just a little bit too optimistic and hopeful!" Somers said. "So over the process of revising the score and some of the music cues, we ended up weeding out the ones that were too bright and optimistic and hopeful. And I kind of went back to the drawing board and wrote a few more pieces that embodied despair and the city that kept running into the ground, people dying, people that didn't have much in the far north. I think he was keen to make sure the music reflected what he felt the story was about -- the tragedy and death and rebirth." Somers added, "He did say he really liked the strings! So I think at some point I did much more music with strings than I originally had." "Dawson City: Frozen Time" (distributed by Kino Lorber) is currently playing in theatres in New York City, Los Angeles, Chicago, San Diego, and Hartford, Conn., and opens Friday in Baltimore and Pasadena. Opening soon in Philadelphia, San Francisco, Columbus, Cleveland and other cities. For more information visit the Kino Lorber website. Review: Haunting imagery of "Dawson City: Frozen Time"